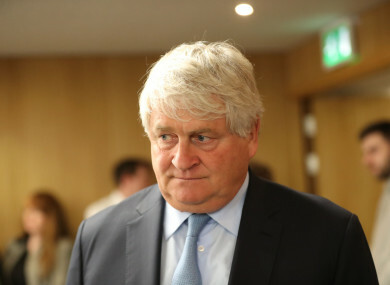 THE SUPREME COURT has ruled that Denis O’Brien’s privacy was not breached during a 2015 debate about the sale of Siteserv. The judgement was delivered by Mr Justice Frank Clarke at a sitting of the Supreme Court in NUI Galway this morning. The judgement came on foot of an appeal by the businessman against a High Court decision from May 2017, when Ms Justice Úna Ní Raifeartaigh ruled in favour of the Clerk of the Dáil and the Dáil Committee on Procedures and Privileges (CPP). O’Brien had argued that his privacy was breached by two TDs – Sinn Féin’s Pearse Doherty, and the Social Democrats’ Catherine Murphy – who gave statements to the Dáil during a 2015 debate about the sale of Siteserv. The businessman alleged that those statements breached his constitutional right to privacy. Those same statements were subsequently declared to be protected under privilege by the Dáil Committee on Procedure and Privilege (CPP), the committee against which the High Court action was based. Dismissing his appeal today, Mr Justice Clarke found that the case against the CPP amounted to an indirect challenge to utterances made in the Dáil, which was not allowed. He noted that there was a constitutional obligation on the Houses of Oireachtas to protect the constitutional rights of citizens in respect of matters that happened within them. However, he also found that the CPP enjoyed the same immunity and privilege as the Houses of Oireachtas in how it considered complaints by citizens who felt their rights had been breached. “The Court has concluded that the challenge with Mr O’Brien has sought to bring to the decision of the CPP involves, in substance, an indirect or collateral challenge to the utterances of the deputies themselves,” the judge ruled. The only practical consequence of a successful outcome to proceedings such as this would be that it might lead to a reconsideration by the CPP of its decision in respect of Mr O’Brien’s complaint. “If that should lead to a different result, then a court would have been, at least indirectly or collaterally, involved in dealing with utterances made in the Houses. Both TDs involved in the case welcomed the decision, with Murphy saying it was further recognition by the courts that parliamentary privilege was an important aspect of Ireland’s democratic system. “The public interest must always be to the fore and that is what has underpinned everything I have done to date,” she said in a statement. However, she added that it was “hugely incumbent” on elected representatives to recognise the responsibility that came with the use of Dáil privilege. Her comments were echoed by Doherty, who added that he had made his statement in the Dáil in the public interest and in good faith. “I shudder to think of the effect on parliamentary debate and our democracy if this judgement had gone the other way,” he said. Today’s ruling was originally due last week, but was delayed because of a ruling in a separate, unrelated hearing involving the Public Accounts Committee. It is the second – also unrelated – case O’Brien has lost in the courts in the past week. On Friday, the businessman lost a High Court action claiming defamation against the Sunday Business Post over articles the newspaper published in March 2015. With reporting from Rónan Duffy. Comments have been closed for legal reasons. Email “Supreme Court dismisses Denis O'Brien's appeal over Dáil debate on Siteserv”. Feedback on “Supreme Court dismisses Denis O'Brien's appeal over Dáil debate on Siteserv”.